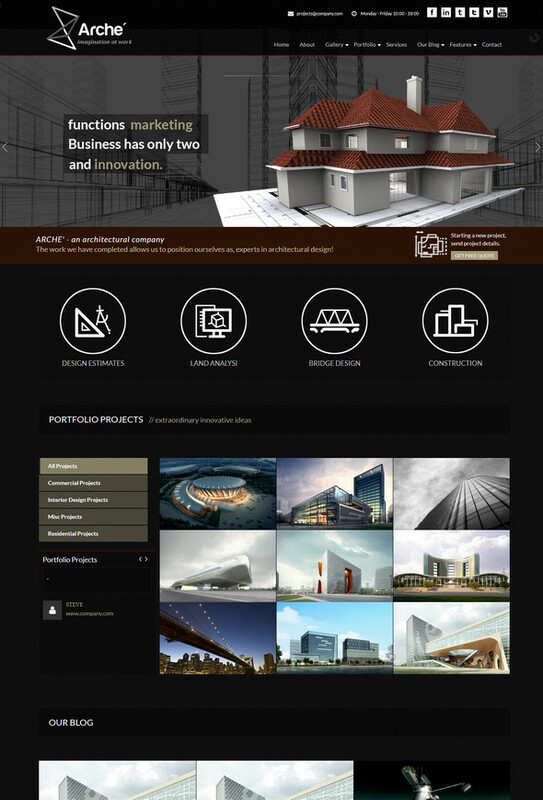 A visually attractive and informative website is a must for being successful in the real estate business. Such a website will help you in showcasing the available properties and the potential clients in finding out what they are looking for. 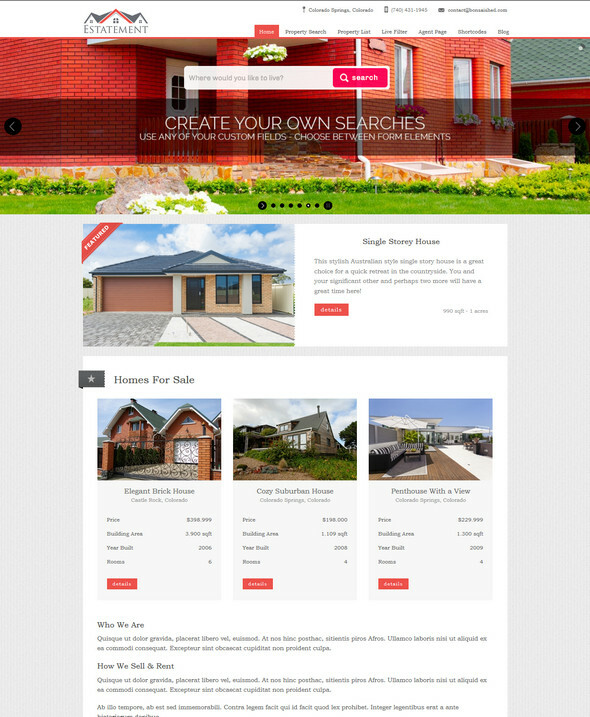 Real estate website is a special field in the world of web development. These websites have some special requirements which are not readily available in the multi-purpose themes. For that reason, you will need real estate wordpress themes that are built especially for this purpose.Therefore, you can’t just use a multi-purpose theme for developing a real estate website. Rather, you will require special, real estate-only themes. While this field does not have a lot of themes, finding out a truly useful one is still difficult. We understand this. 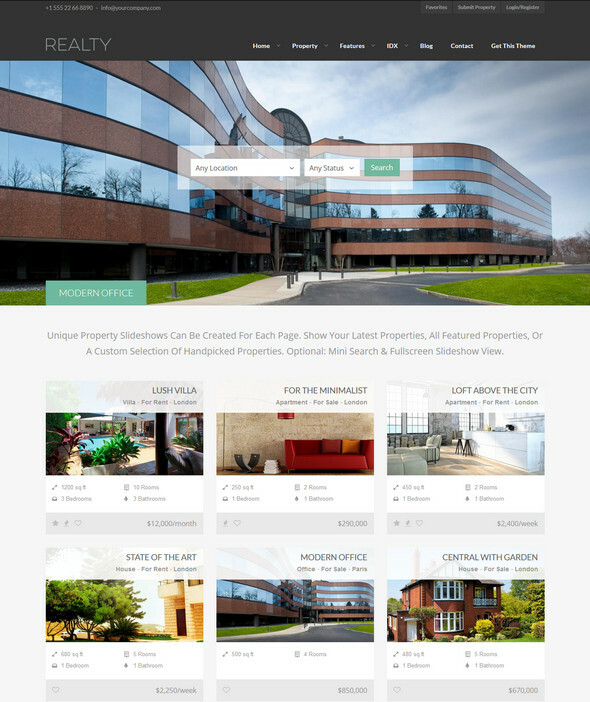 That’s why we created this list of 30 beautiful WordPress real estate themes. Read on to find out the theme you are looking for. Integrating Google Maps and OpenStreetMap, Zoner is an excellent real estate theme for WordPress. The unique functionalities, features and the design have made the theme very attractive. It could be used to create personal, agency or corporate real estate websites. Packing premium plugins like Revolution Slider and Visual Composer, Arkitekt is a very powerful real estate theme. The fully WPML-compatible theme comes with unlimited sidebars, intuitive admin panel, dedicated support forum and a detailed documentation. Real estate agencies need gorgeous-looking, professional design that will attract the visitors at the first glance. Realty is exactly that kind of theme. Along with the fantastic design, the theme is rich in the features section too. Realty aims to create information-rich real estate websites that will be very useful for the visitors. You can add property videos in the slideshow, property listing and property details pages. All the images and videos could be loaded via lightbox. 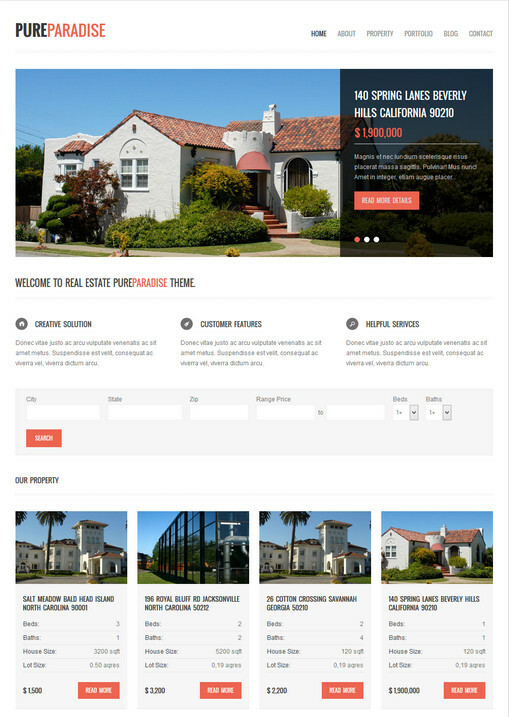 This fully responsive WordPress theme is especially developed for creating real estate websites. The SEO-ready, performance-optimized and cross browser compatible theme will ensure the best possible performance for your site. 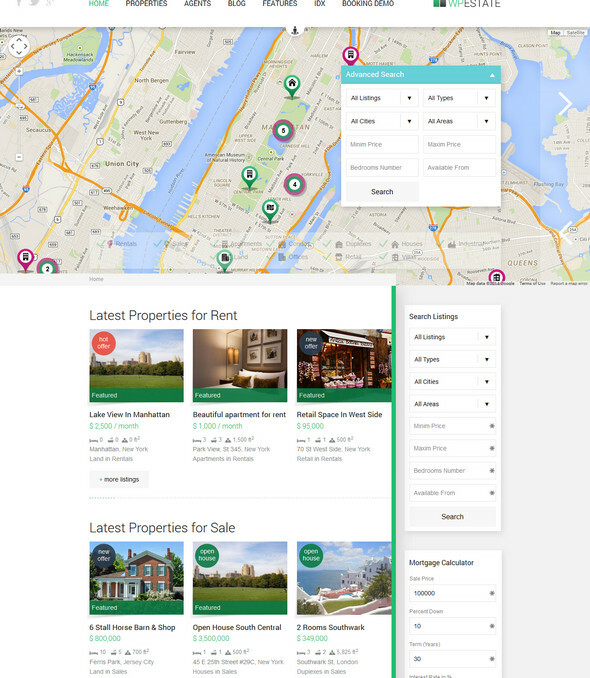 Based on Bootstrap framework, this real estate theme works perfectly in any screen size. The completely retina ready theme comes with front-end property submission, easy agent management and advanced search facilities. Displaying your available properties is very easy with Freehold. This full featured WordPress theme is provided with a detailed help file. The retina-ready theme is completely responsive too and integrates Google Maps too. 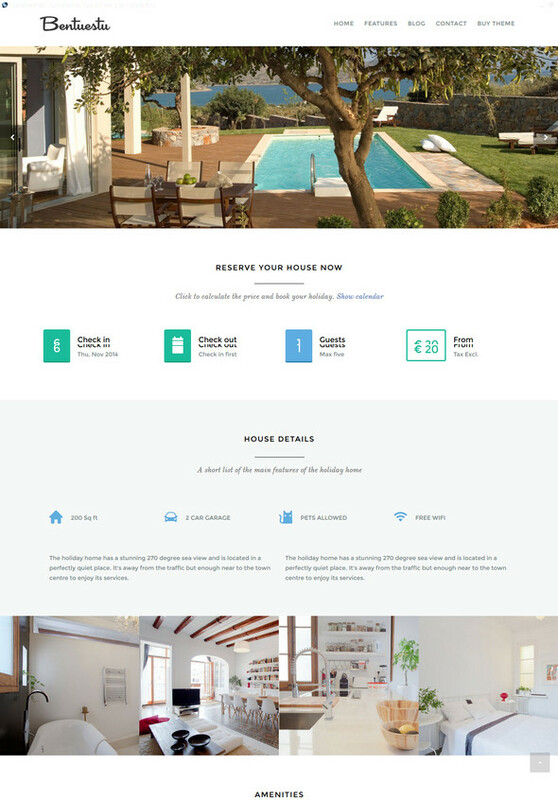 This simple and flexible WordPress theme will make renting or selling properties very easy. The fully responsive theme is provided with availability calendar, a robust booking system, powerful theme options and lots of shortcodes. 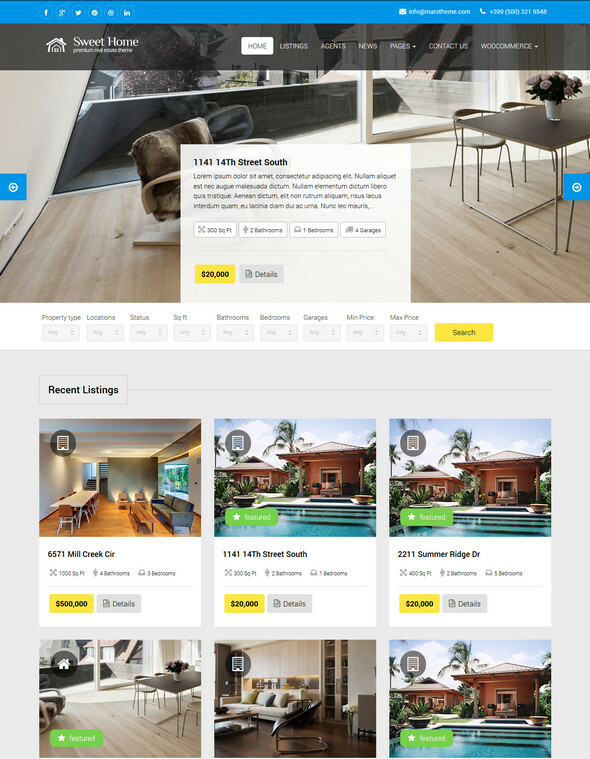 Designed for renting properties online, Bentuestu is a full-featured real estate theme. The Bootstrap powered theme is provided with powerful features like attractive slider, availability calendar and advanced booking system. 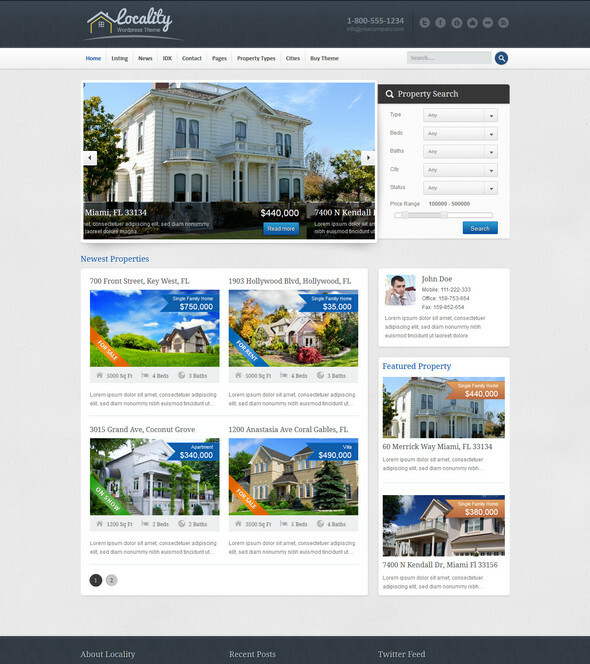 Developed by an elite author, Sweethome is a fully responsive real estate theme for WordPress. The WooCommerce supported theme comes with 12 custom widgets, multiple blog layouts and a powerful theme options section. Featuring a powerful page builder for creating unique pages and a powerful admin panel to control various sections, Sweethome is an attractive WordPress theme. The advanced search form will allow the users to find out their desired properties easily. 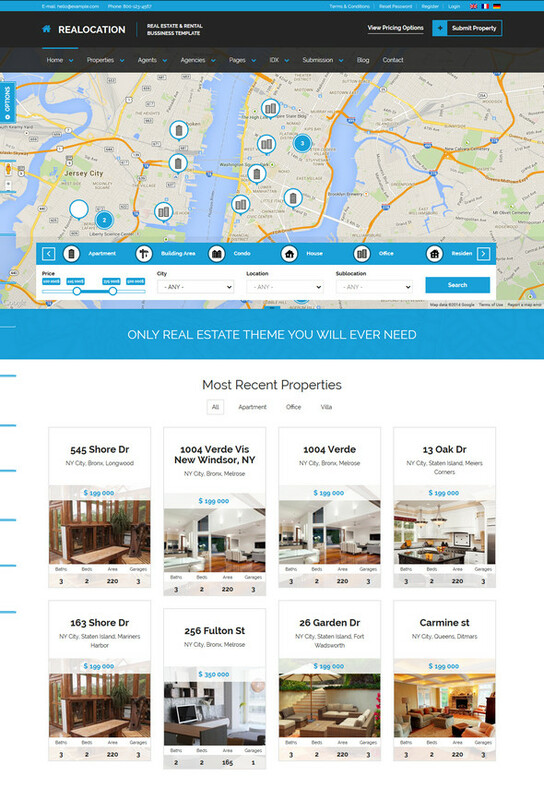 With a modern, clean design, Real Property is a fully responsive real estate theme. Useful features like detailed property information, Google Map integration, agent listing, advanced search and front-end property submission etc. have made this theme an ideal solution. WP Estate is a very popular choice among the premium real estate themes and rightly so. It has useful features like STRIPE merchant integration, availability calendar, AJAX-powered invoice, booking form, interactive messaging and advanced search facility. 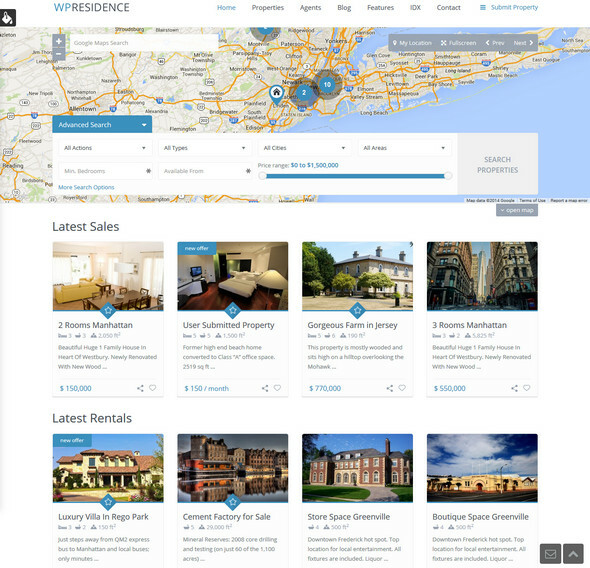 While WP Residence was especially designed for independent real estate agencies or agents, it can also be used as a listing website for properties. It comes with useful features like price slider, detailedfloor plan, print listing etc. Some interesting features of the theme includes membership subscriptions, custom property fields, AJAX-powered search, Google Maps integration etc. 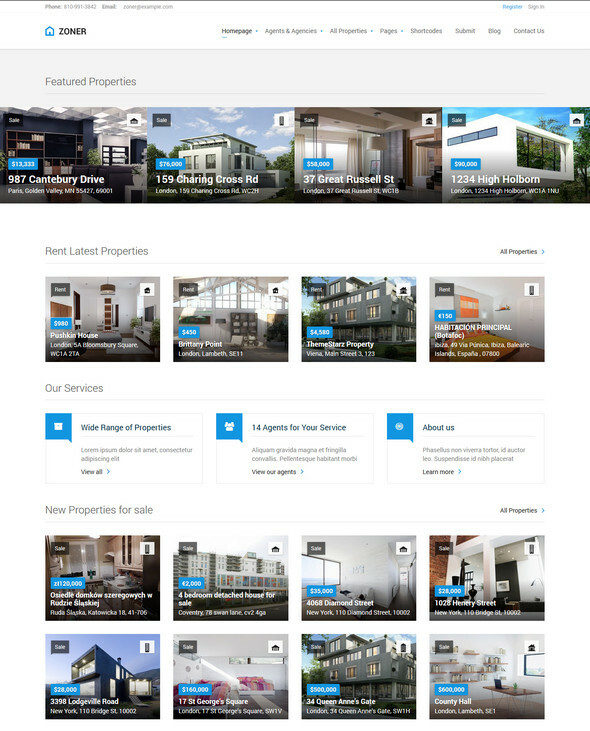 This clean and beautiful WordPress theme could be an excellent choice for creating your real estate website. Featuring powerful options like complete PayPal integration, Google Maps Pro+, Revolution Slider and IDX plugin support, Javo House is a completely responsive WordPress real estate theme. The theme also has a handy front-end form for the agents. With a vast user base, Real Homes is the real deal for your next real estate website. 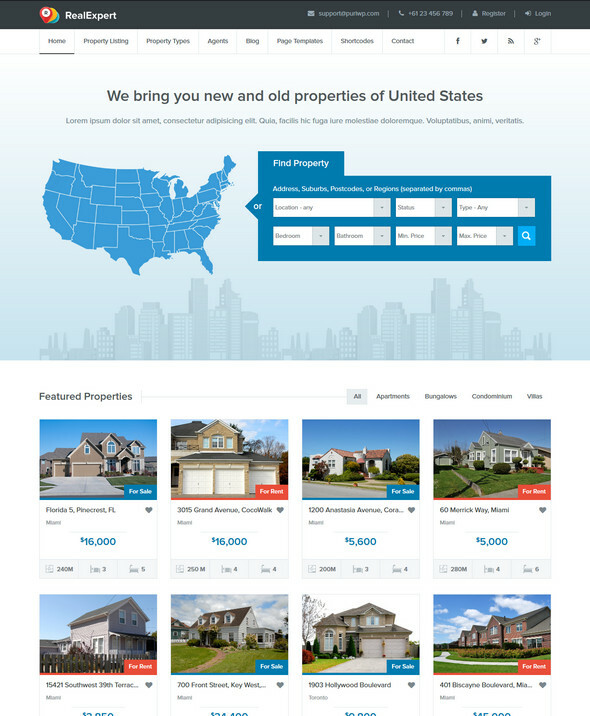 The beautifully designed theme lets the users submit property from the front-end. Other useful features include IDX support, PayPal integration, custom widgets, Google Maps etc. 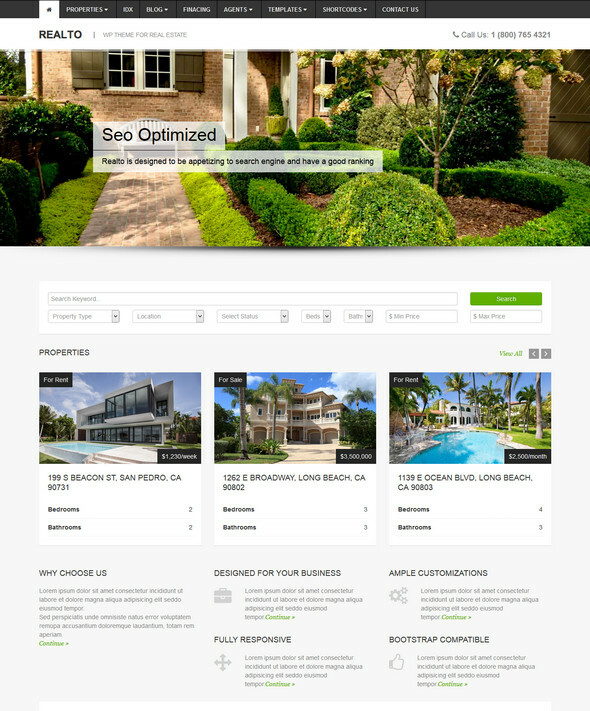 Realocation is a perfect theme for creating real estate agents, agencies or company websites. The Bootstrap-based theme has custom map styles, lots of widgets, custom map markers and front-end submission facilities. Besides the nice and clean design, Real Estate has other strong points like seamless integration with property information, property images and videos. The localization ready theme supports dsIDXpess IDX plugin too. The theme allows you to add detailed property information with photos and locate the property in Google Maps. 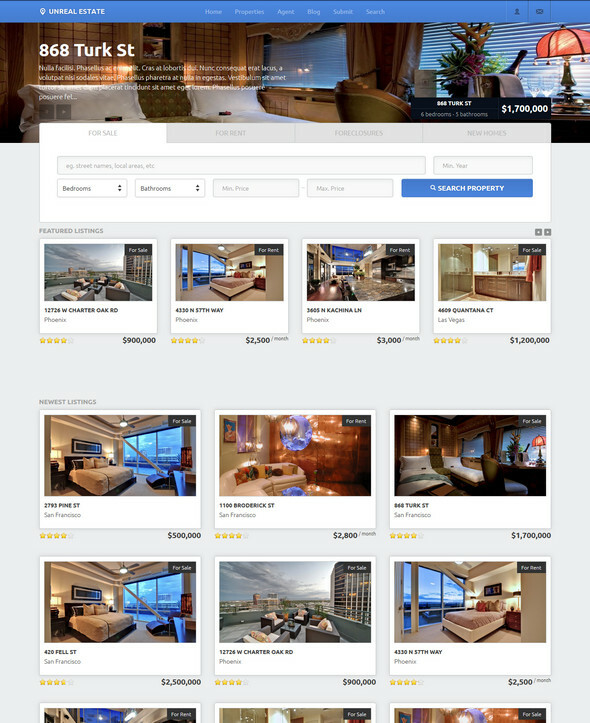 OpenDoor comes with two slideshow layouts and listing compare feature. 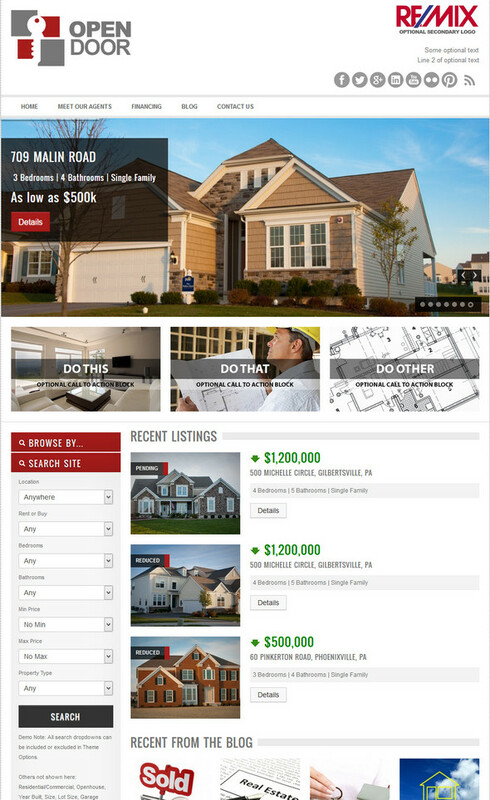 This real estate theme is fully responsive, which means it will work on any screen resolution. The advanced search feature is a very useful addition too. 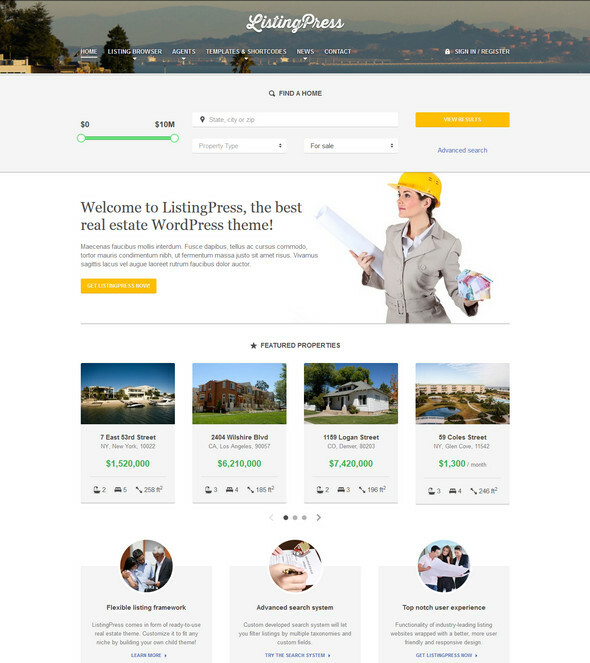 If you are looking for a clean, responsive, flexible real estate theme for WordPress, then look no further. Realto is the perfect theme for you. With this theme, you can create top class, professional quality websites within a very short period of time. 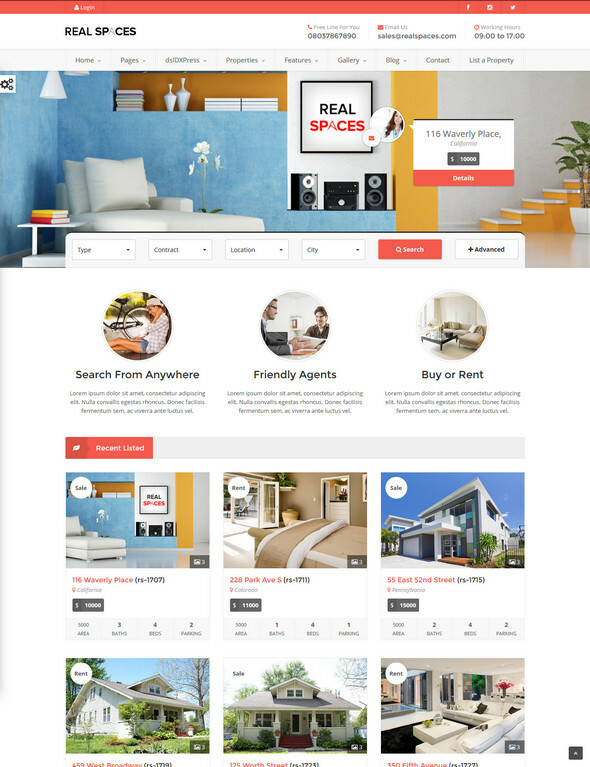 This rental and real estate theme lets you create your own website within a few minutes. With dsIDXpress and native WP Theme API support, this theme is very easy to use. You will also get unlimited customization possibilities with this theme. 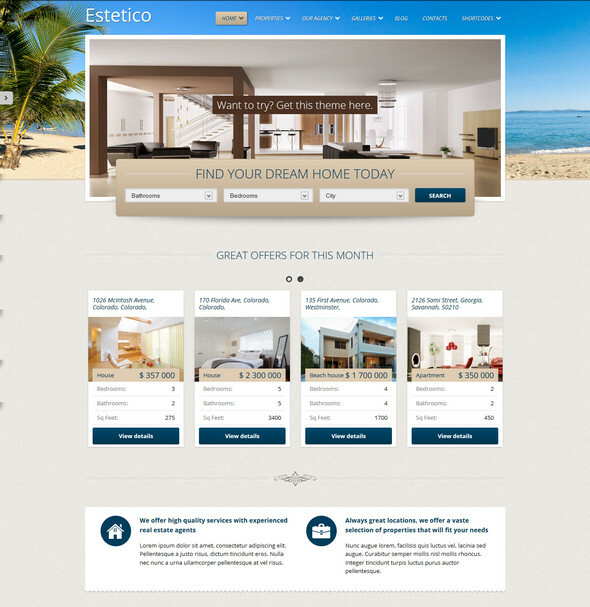 Estetico is a fully responsive real estate WordPress theme. Besides Revolution Slider and Visual Composer support, the theme also supports Google Maps with its street view feature. It also gas unlimited property features and multiple browsing mode. 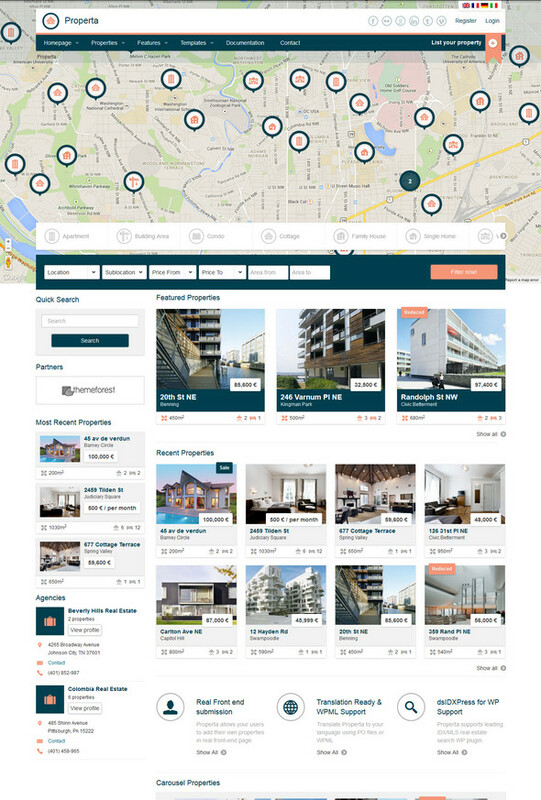 Locality comes with dedicated localization support, multiple home page layout and fully searchable property listing. Special taxonomies including property type, location and unique property features etc. have made the theme more attractive. 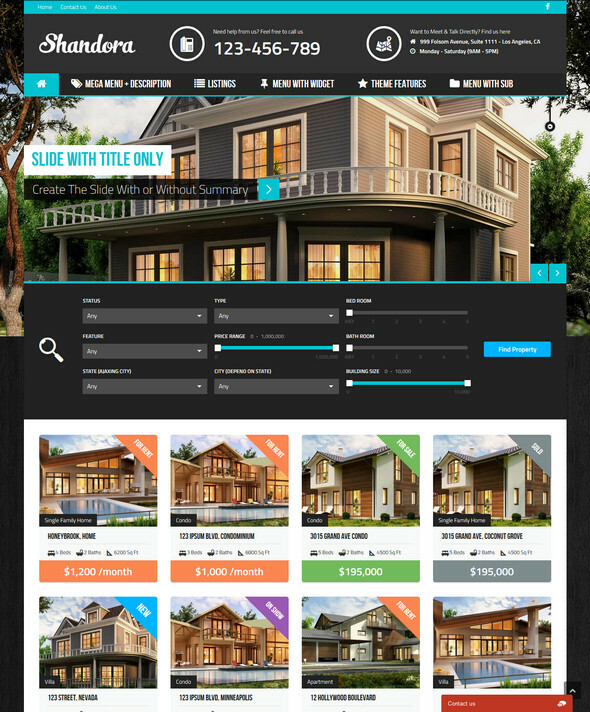 This is a special WordPress theme for developing architecture and real estate websites. With a powerful admin panel, robust page builder and unlimited color options, the theme is very easy to customize. 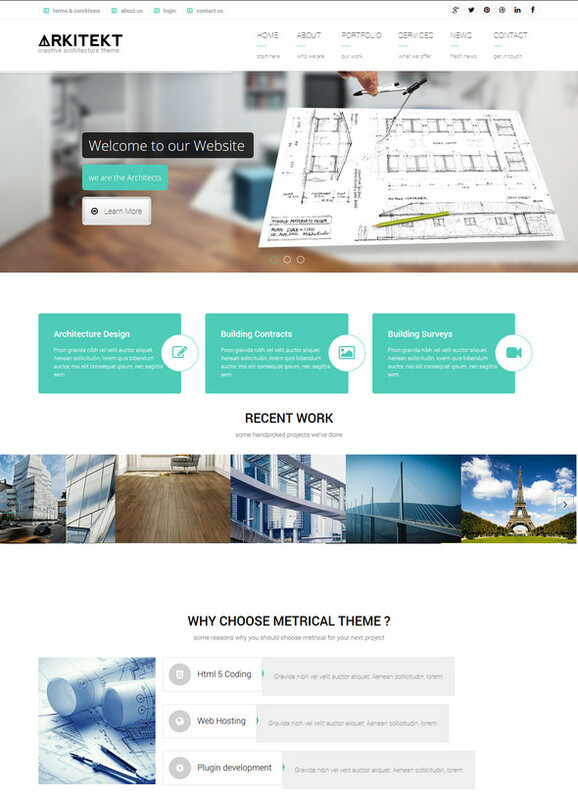 This minimalist real estate theme comes with a clean, flat but attractive design. Being a perfect solution for agencies and companies, the theme could also be used to create professional websites. Along with easy personalization, the theme also includes RevSlider, FlexSlider, lots of shortcodes and dsIDXpress support. 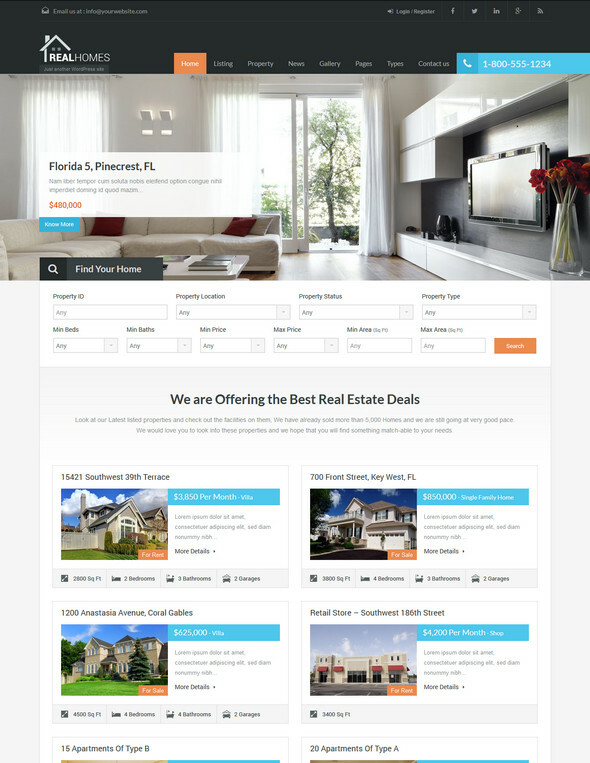 Pure Paradise is a simple, clean WordPress theme for developing real estate websites. 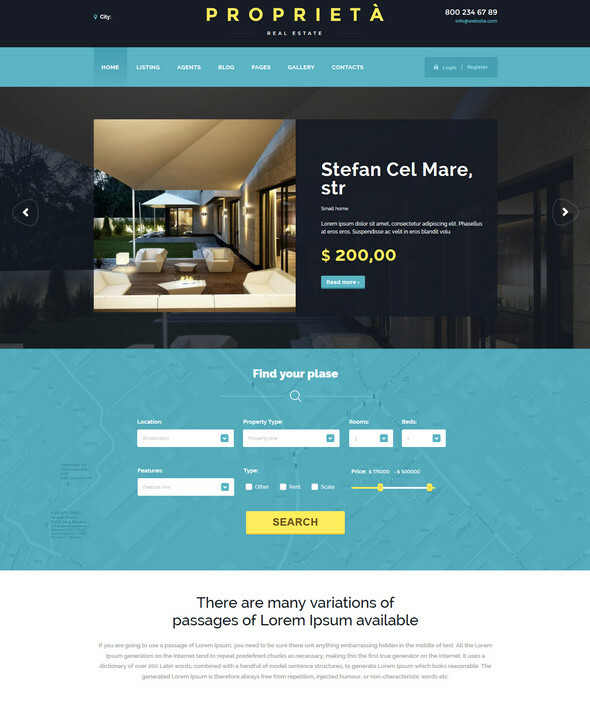 The completely responsive theme has dedicated bog and property sections, 6 different page templates and unlimited background and colors. 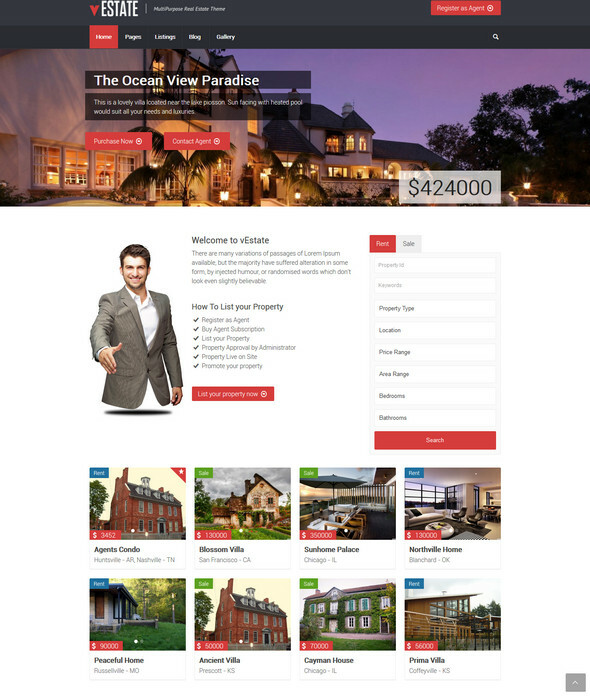 This premium real estate theme has a fully responsive layout. 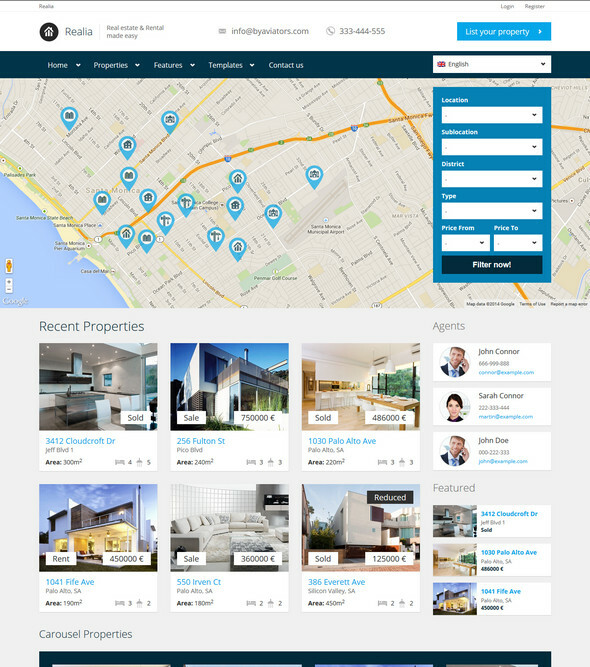 Powerful features like advanced property search, complete IDX integration, property slider, custom widgets, unlimited color and styling options etc. have made the theme an obvious choice. Unlimited page layouts, multiple built-in sliders, filterable pagination, multiple layouts, built-in listing manager etc. are some of the most attractive options of vEstate. 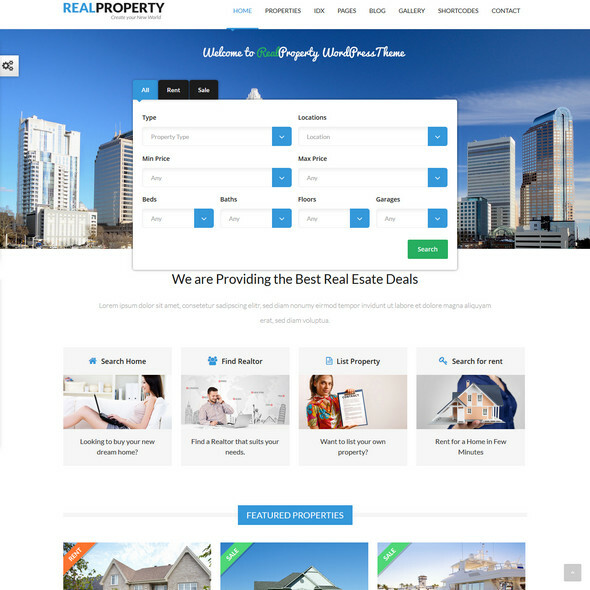 This awesome real estate theme is fully responsive too. Featuring three different ways of displaying information, Unreal estate makes real estate websites more real. The retina ready, completely responsive theme comes with all the relevant page templates and front-end submission facility. 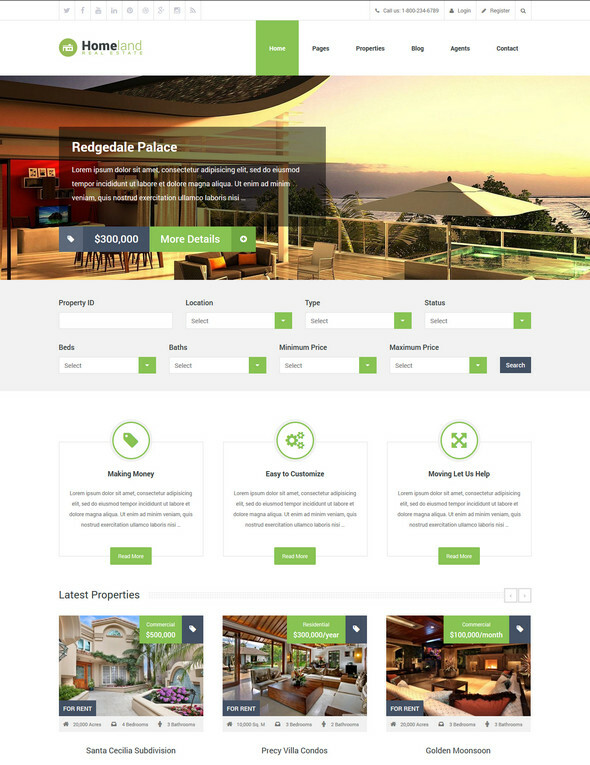 Based on Foundation framework, Shandora is a very flexible real estate theme. 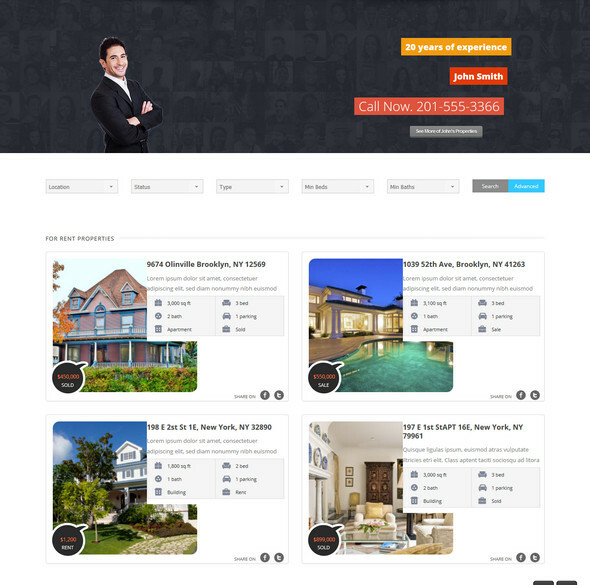 The theme comes with a very powerful search option which lets the users find out their desired properties easily. 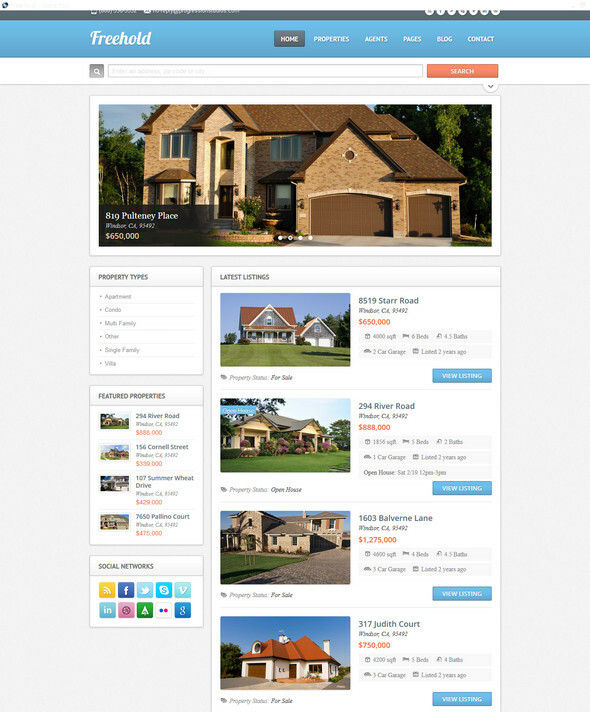 The retina-ready Shandora theme is an excellent real estate theme for WordPress. The modern, elegant theme supports off-canvas navigation, which shows the map in mobile devices too. Live chat, polling system, integrated page builder etc. are some other useful features. A perfect theme for renting or selling properties online, Estatement is a unique WordPress theme. The powerful search feature of the theme will allow the visitors to find out what they are looking for. PayPal integration has made payment processing very simple. 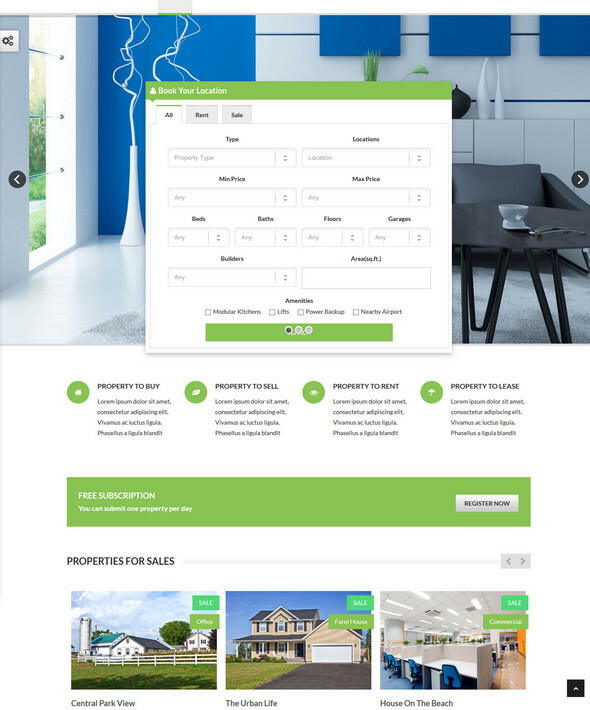 Properta is a dynamic real estate theme with useful features like front-end submission, complete PayPal integration, full WPML support, ultimate touch friendly user interface, advanced Google Maps integration and lots of custom widgets. Unlike other themes of this list, this is a dedicated listing theme for WordPress. The built-in API will make sure that you can customize the search filters easily and fit them for different niches.